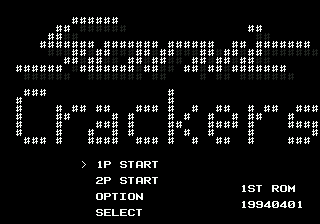 One of the oddities of the Sonic secrets community: Sonic Crackers. Crackers was a 'submissions' ROM. Submission ROMs are to show new ideas to management and to see if they would get approved. Clearly this demo was used to create Knuckles' Chaotix later in life. This is the title screen, a very basic one at that. 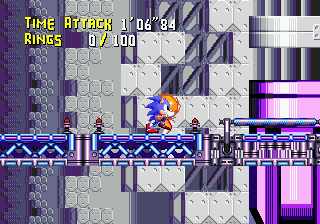 The 'Sonic' also has a hidden backdrop you can see if you edit the colours. The date is for April 1st, April fools day, butit was most likely a joke by the programmer. The ROMs title is also 'Sonic Studium', merely a ramdom insertion by the programmer. In the game the two players are stuck together with rings, in which they must use together to snap each other around like slingshots to reach new areas. A character can 'hold', causing the slingshot to stretch, and get full speed very quickly. This equiptment was used eventually in Knuckles' Chaotix on the 32X, meaning this prototype was turned into Knuckles' first single outing. In this prototype, the physics engine is not complete. 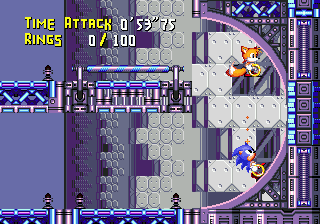 Sonic & Tails can both walk up these half-loops as if they werestraight platforms. You can even stop onto them and not fall off. You can jump off of them though. 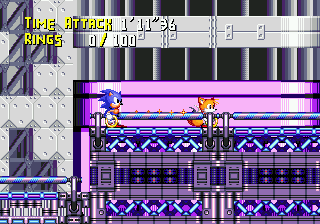 Sonic & Tails are also on different layers for some parts, particulary along these bars. Sonic can still interact with him normally regardless. The other part found in Chaotix is the ability to throw your character. 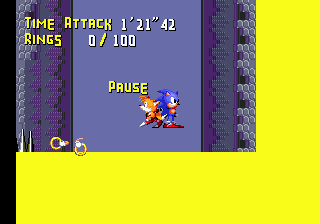 Sonic or Tails can pick up each other and throw them in different directions, allowing them to reach new platforms by 'Yo-Yo' techniques. 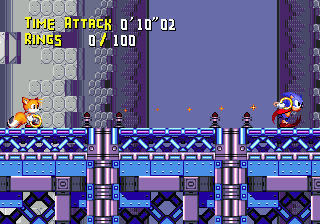 In this demonstration there is also an early debug, which allows you to pause the game and float around the stage. Your arms become detached during this, but as soon as you unpause they retract back.